The 2019 Yamaha Sidewinder L-TX LE boasts 200 horsepower, new intuitive controls and virtually instant thumb-activated suspension control. You’re a seasoned trail rider with years of experience and definite ideas of what you want in your primary ride. You’re looking online at the various choices from the four sled makers. You want something new, not the same old thing. You want something that will go beyond your current ride. What do you choose? If it’s us, we look hard and very long at the 2019 Yamaha Sidewinder L-TX LE. Aside from the glaring graphics of high visibility lemon and Yamaha blue, the base L-TX may seem very much like the 2018 version. 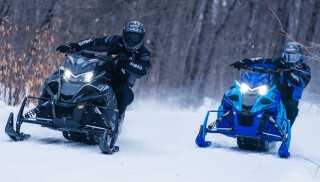 You are partially correct, but the changes for model year 2019 make it truly different, unique and define it as a sled you should truly covet. Hi visibility graphics makes the LTX LE stand out and its superior handling package lets it grip the trails with authority. 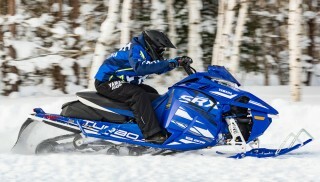 As the fourth-place sled maker, Yamaha is extremely serious. Check out the model offerings. Apparently Yamaha dealers have necessary inventory in heritage models like Apex, Vector, etc. and partnership models like Vipers. There is only one 2019 designated Viper offered by Yamaha dealers this season, but a goodly offering of Sidewinders, which has been Yamaha’s most popular full-size model since its introduction. Who doesn’t like a smooth running, 200-plus horsepower sled? The LTX LE uses an aggressive 1.6-inch lug profile Cobra track to spin around its 137-inch SR rear suspension. Back to the 2019 Yamaha Sidewinder L-TX LE. Yes, it shares much with its previous season counterpart, but there are tantalizing new features that almost totally change the LE’s persona. Key for us is the all-new “interactive” pushbutton suspension system. The Fox Zero iQS shock package comes from a three-way partnership between build partner Arctic Cat, Fox shocks and Yamaha. The system is brilliant, taking the easily understood, easy to use and popular QS3 shock system to an electronically activated pushbutton system. Once the mode is activated, you simply push in the button on the left handlebar control to scroll to one of three suspension settings — soft, medium, firm. In a blink of an eye — two-tenths of a second, actually — the shocks reset themselves. The two front shocks and the rear suspension arm reset simultaneously. 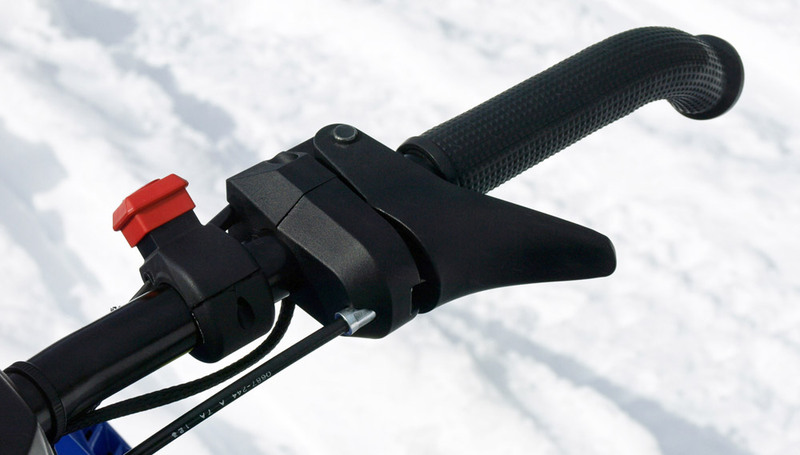 You don’t have to stop trailside and set a QS3 lever or wait for an air shock to fill up. Push the button and keep riding. Key for us is the all-new “interactive” Fox Zero iQS pushbutton suspension system that comes from a three-way partnership between build partner Arctic Cat, Fox shocks and Yamaha. The system is brilliant, taking the easily understood, easy to use and popular QS3 shock system to an electronically activated pushbutton system. Ever the skeptics, we really weren’t buying the simplicity from the driver’s seat. When test riding, the only issue we ever had with the system was the initial engagement. When you push in the button to set the suspension mode, look for it on the master screen where it takes up the left side of the dual screen control gauge, moving speed and rpm to the right screen. Expecting blazing internet speed like with our home computer, the sled screen mode takes a few extra milliseconds to come up and we would bypass it in our impatience, but it will come up and it when it does the system works flawlessly. 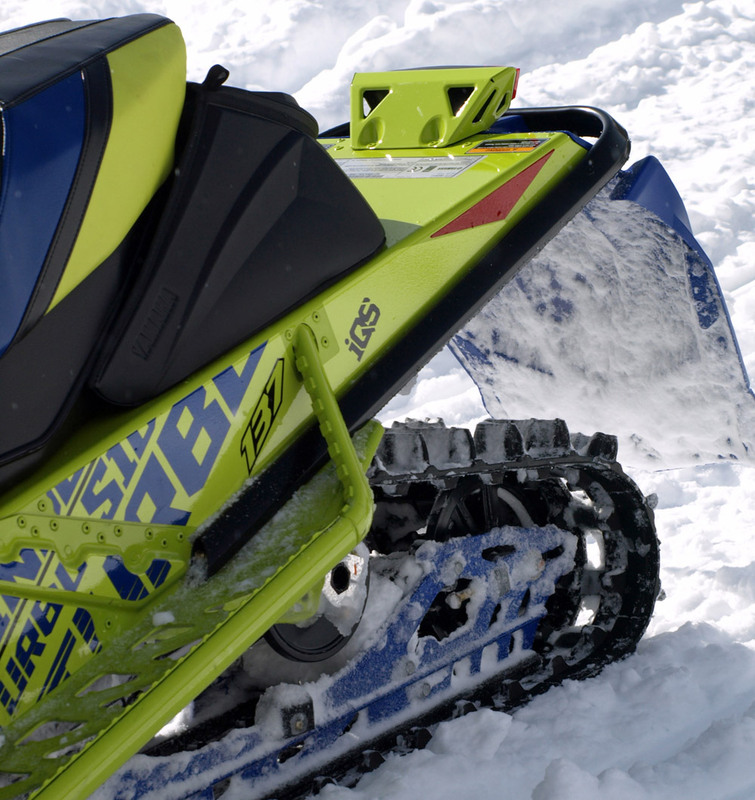 The Yamaha nomenclature of Fox iQS gives Fox more credit than does Arctic Cat, which names its system iACT. While no one has explained the “why” to us, we figure this is to circumvent Cat getting ripped off for all of its invested technology. Hey, the system works great, and we fully expect to see Yamaha and Cat competitors going to Fox for systems of their own. 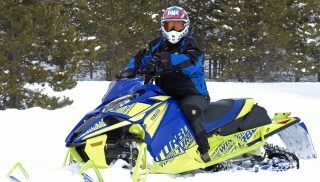 You gotta believe the market leader, Ski-Doo, is eying a push button rMotion derivative. Polaris works with Fox QS3 shocks already and a pushbutton suspension system would be a natural for the Adventure series. Once the iQS mode is activated, you simply push in the button to set the suspension mode and look for it on the master screen where it takes up the left side of the dual screen control gauge, moving speed and rpm to the right screen. We found the system works flawlessly. While Fox makes the QS3, the iACT has key proprietary pieces developed by Arctic Cat and its partners like the “brain box” that controls how the electrically controlled shocks work and how it gets wired into the sled. Don’t look for a ready sharing of information in the near future. That’s the future. 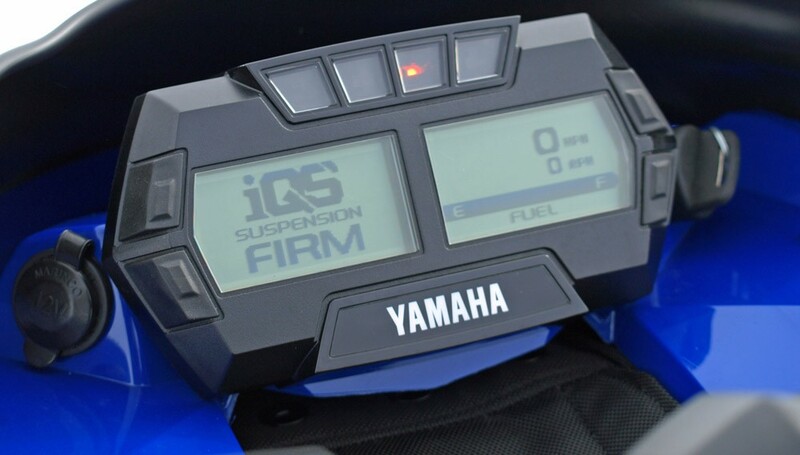 The here and now has Yamaha utilizing this system on models that it wants you to order during the Spring Power Surge and is why you’ll also find iQS on the newest iteration of Yamaha SRX, designed to be an all-out lake racing go-fastest sled for 2019. Our choice for best all-around 2019 Yamaha remains the L-TX LE. 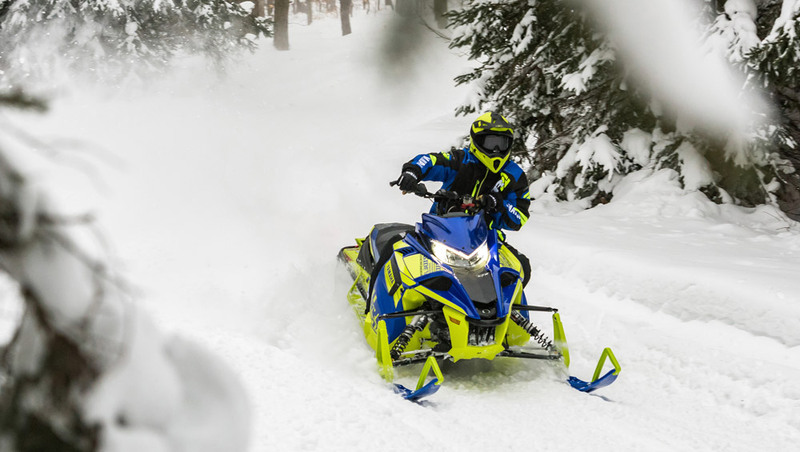 Think about it, the 2019 Yamaha Sidewinder L-TX LE with that 998cc Genesis three-cylinder turbo not only has the most horsepower you can buy in a production sled, but it is also, in our opinion, the most drive-able sled you can buy. You’re getting exactly the same power output in the LT-X LE as you get with the SRX. It’s fast. It’s strong. It’s totally manageable, something we can’t say about other turbocharged four-strokes offered for 2019. It’s like driving a well-mannered car, think Audi, BMW, Cadillac, Lincoln or Mercedes-Benz. Power is smoothly delivered; credit the Yamaha YSRC high performance clutch system, and the carefully integrated Mitsubishi electronic control module that assists the engine’s triple throttle body induction system to help minimize any lag. Of course, the engine and power delivery are known. It’s the culmination of “little” things that add up to an enhanced rider experience for 2019. The all-new left-hand rider controls are now incredibly intuitive, and the results of your inputs can be seen in the center mounted multi-function gauge. This no small thing as too many sleds have controls either too simplistic and therefore limited to handlebar heat settings of high, low and off. The Yamaha “Stealth Control” switch cluster lets you quickly access the “on the fly” suspension setting as well as the handlebar and thumb heaters. In addition, the pushbutton activated mechanical reverse gets its place in the Stealth cluster. The right thumb activates a new Apex-like ergonomically-shaped throttle for easier engagement and long mile comfort. Back to the left hand, Yamaha adds a shorter composite brake lever backed up by a larger brake reservoir. 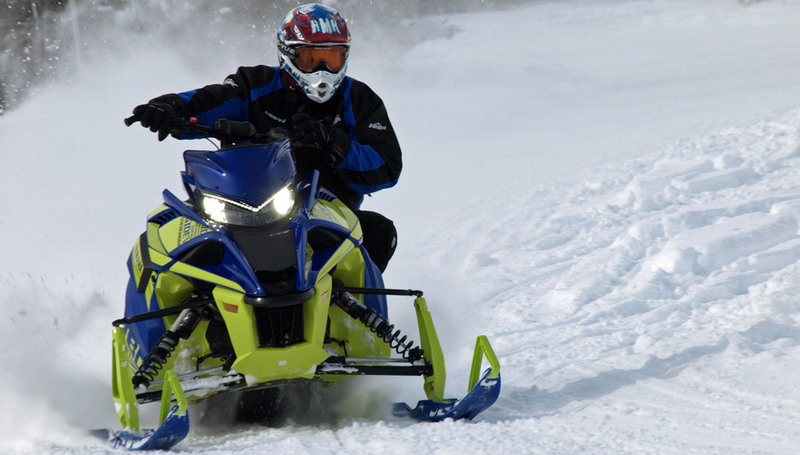 It’s easier to reach and modulates well with no loss in braking power — something critical to a 200hp sled! Your right thumb activates a new-for-2019 Apex-like ergonomically-shaped throttle for easier engagement and long mile comfort. As a seasoned trail rider, you’ll approve of the heated seat on the 2019 Yamaha Sidewinder L-TX LE with its dual settings and the new larger tunnel bag with enhanced storage capacity. 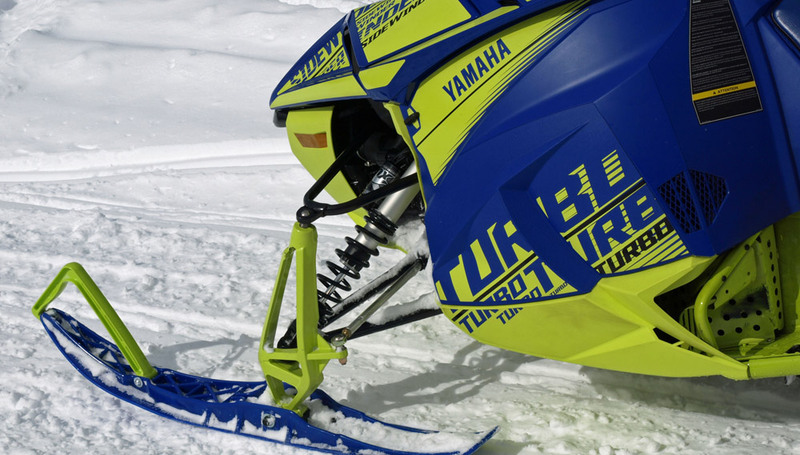 Yamaha’s choice of its Tuner III skis makes getting around corners and tracking down long stretches of trail easy-breezy. The only thing you might find too much is the sled’s graphic package. That Hi Vis Racing Blue combination on the 2019 Yamaha Sidewinder L-TX LE stands out and can be overpowering. It leaves no doubt that you’ve arrived. With 200 horsepower, new intuitive controls and virtually instant thumb-activated suspension control, you have arrived!